Explore the amazing career of photography. Photography careers can be an lucrative and exciting way to showcase your artistic ability. A Crash Course on Professional Wedding Photography by KL. RAJA PONSING. Basic DSLR Photography weekend course participants must have an interest and attitude to learn photography with at least school final, higher secondary education.The new generation digital SLR cameras have a lot to offer for a photographer.A Crash Course on Professional Wedding Photography. Product & Advertising Photography Location Photography People & fashion Photography Corporate & Industrial Photography Portrait & wedding Photography. 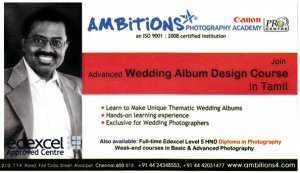 Ambitions 4 Photography Academy is one of the four Canon's official digital photography training centres in India.